Hand delivery in local area of Canton Ma and radius. 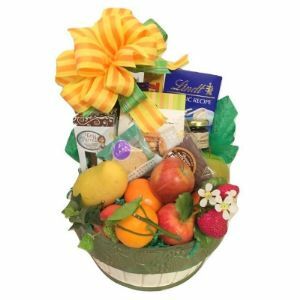 The round basket includes 1 Naval orange, 2 red Apples and 1 Green Apple plus grapes. Cookies, selection includes chocolate covered Graham crackers, Nicki's Lemon shortbread and Cinnamon shortbread, 2 Toffee Biscotti, Toblerone Bar, Cadburys bar and Ghiradelli Bar plus a small Fruit Preserve. Summery Ribbons and bows accent the wrapped gift.